ARTICULATED ARMS: Articulated arms have a fixed arm 785 mm long in two versions: straight and curved, and a second arms 800 mm with a vertical displacement of about 1100 mm. They are designed to bring integrated PC, monitor, TV and to be placed in pole, wall, ceiling or floor. 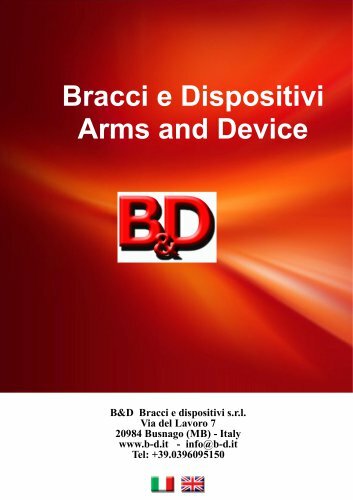 The B&D arms using the various applications, with a range up to 9 KG. All arms are equipped with a handle with VESA attack from 75-100 mm or a handle or keyboard port; the cables are integrated and customizable in both type and in length; all their movements are massaged to fit every need. BLOCKS AND ADAPTERS In order to properly place the monitors and their arms in the right balance between ergonomics, simplicity and aesthetics, there are applications: ceiling, wall, floor, or pole. All applications that B & D manufactures, are designed for easy and ergonomic application on any type of surface of arms with pin diameter 35mm.. 1. 2. 3. 4. 5. 6. 7 8. Ceiling application Wall application Floor application Pole application with jaw Table application Flat-faced Block Mobile support with pole and compartment Mobile support wiht pole.